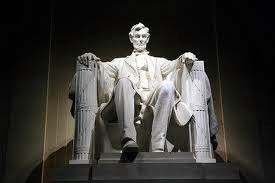 I'm the only member of my family who hasn't been to our nation's capitol, and this week, I'm righting that wrong! I'm spending the week with my hubby in Washington D.C., Baltimore, Anapolis, Alexandria, and who knows where else the road will take us! On Tuesday morning, one of the highlights of my trip will be spent with the Docent of the quilt collection at the Smithsonian Museum. She will be taking a small group of us behind the scenes to see and learn more about the quilts, the collection, and I think where they're housed, etc. I can hardly wait! I won't be blogging this week while I'm gone, but will be posting to my Facebook pages. 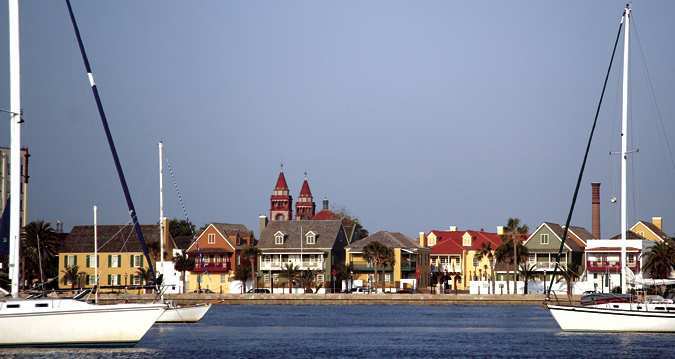 If you have any recommendations of what to visit, where to eat while in the area, or other favorite haunts, I'd love to hear from you. I probably won't be making too many quilt shop stops as we just don't have the time, but...well...ya never know! I'll share my trip when I get back. Welcome to the Big Reveal!!! I really, really hope you like how the quilt has turned out!!! I'm loving it. Having the blocks set on-point gives them a new look, and I love the "Flying Geese" points radiating from the center square. The quilt has lots of movement to it as your eye travels from place to place, and the quilt setting not only calms the quilt, but also serves to separate and anchor the blocks. *Cut (2) 12 5/8" squares - cross cut twice for side triangles. *Cut (2) 6 5/8" squares - cross cut once for corner triangles. *Cut (3) 1 1/2" x WOF strips; subcut (18) 1 1/2" x 6 1/2" strips for block side sashing. *Cut (4) 1 1/2" x WOF strips. These are the long, horizontal (in-between rows) sashing strips. Measure the length of your rows and cut. *Cut (4) 3 1/2" x WOF strips. *Cut (4) 2 1/4" x WOF strips. 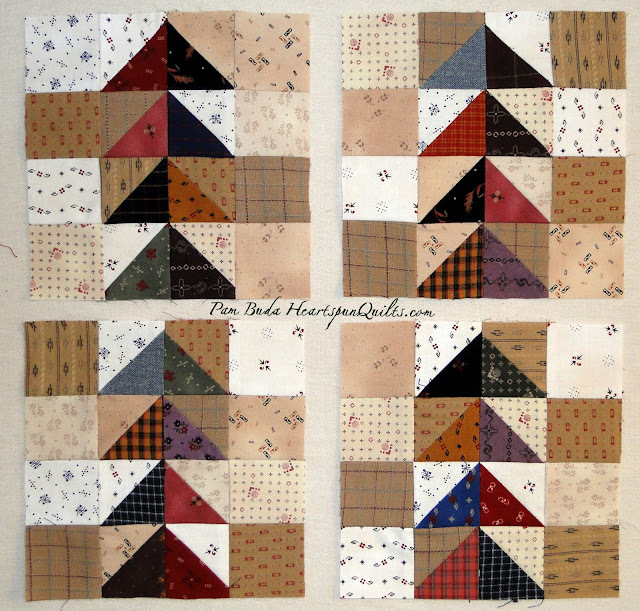 *Sew your quilt top together in a diagonal set. *Sew a 1 1/2" x 6 1/2" strip onto the sides and in between the blocks; in all cases, press to sashing. *Arrange the long sashing strips, the blocks, and the setting triangles as shown in the photo. Sew together, diagonally, into rows; again, press to the sashing. Sew rows together; press. 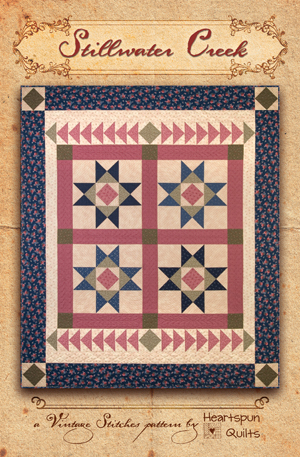 Your quilt center should measure approximately 30 1/4" square. 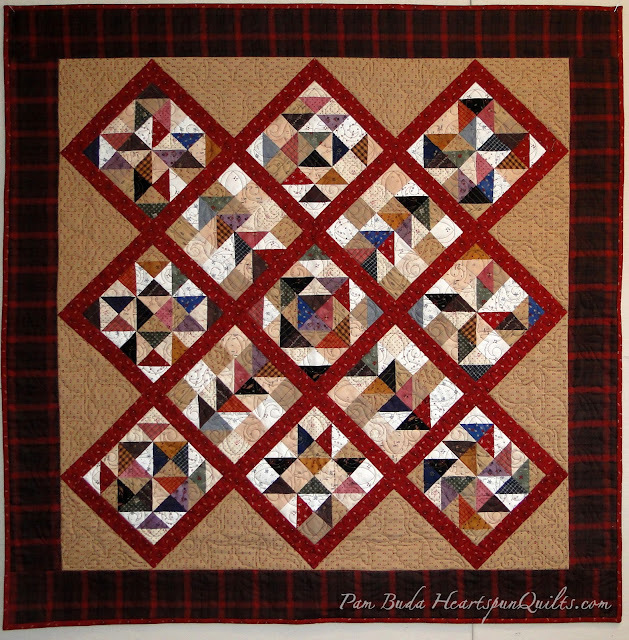 *Sew brown plaid side borders first, then top/bottom borders; press to the borders. 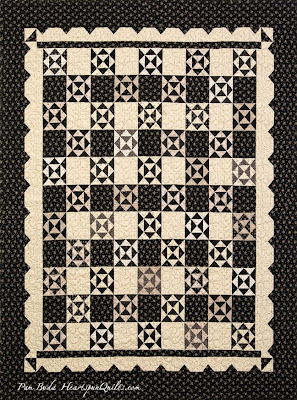 *Your Nabby's Dowry quilt should measure approximately 36 1/4" x 36 1/4" unfinished. 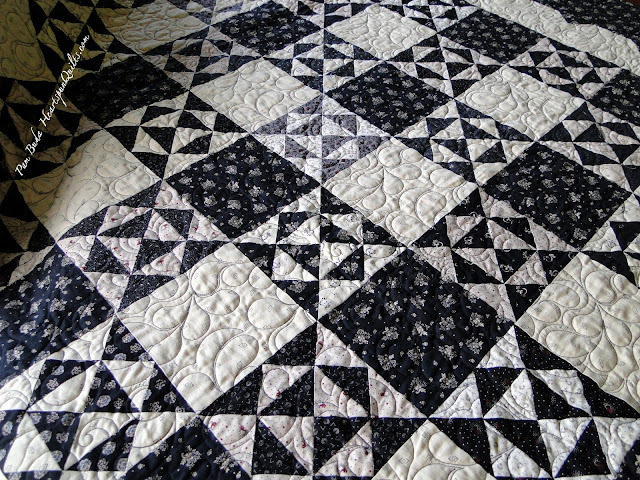 I know everyone enjoys seeing all the different quilts just as much as I do!! All you have to do is sew your top together. 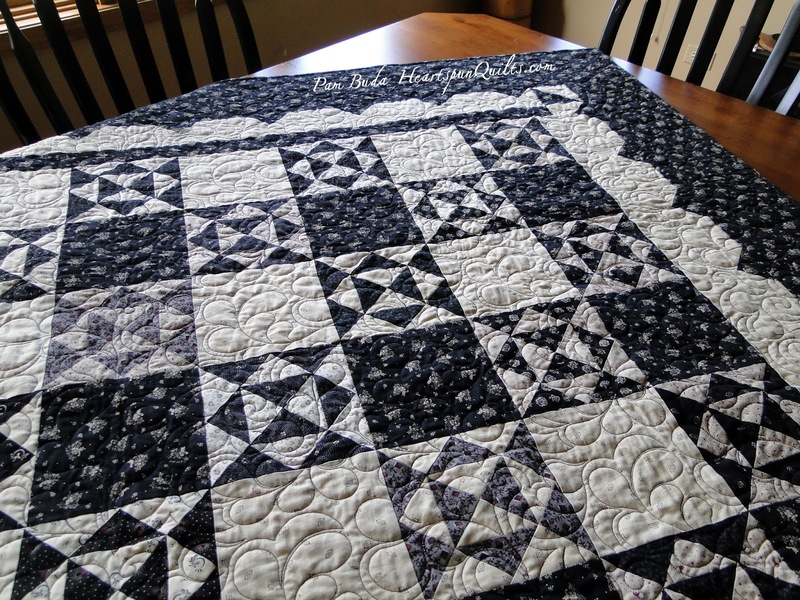 It does NOT have to be quilted!! Email a JPG photo of your quilt to me at Pam@HeartspunQuilts.com. Tell me where you live (state or country is good) and anything else you'd like to add. Like, how you chose your fabrics, why you participate in sew-alongs, what else is happening in your life....anything you'd like to share. I think it will be fun to read about other peoples experiences, and what they've been sewing with, etc., while we've all been piecing together. After all, we've been meeting here on my blog every Friday for the last 12 weeks!! So, lets get to know each other a little better! If you'd feel more comfy just giving your state or country, that will be just fine, too! No worries!! Send your photo no later than December 1st! If you've been thinking about joining Lynne Hagmeier (Kansas Troubles Quilters) and me this coming Jan 20-24th for our wonderful winter get-away to SUNNY St. Augustine, Florida....today is the day to call!! Deposits are due this week and we still have room for just a few more!! We have FOUR fun projects for you, and ALL THE KITS ARE INCLUDED, along with your classes, some meals, and your room at the fabulous, ocean front, Hilton Hotel!! All for only $725 per person!! That is an unbelievable rate because the room alone is going for over $900 on the Hilton website!! Click here to see all the projects and get all the info. Call our travel planner, Bunny, at (815) 715-8483 to make your reservation. Did you see my newest quilt design in my last post? made with my new fabric collection, American Gothic for Marcus Fabrics!! thesepast twelve weeks.... across the U.S. and around the world!! I hope you've enjoyed the process and like the completed quilt. It has been my pleasure to present another sew~along to you. Stay tuned....there's a lot more good stuff coming soon! Introducing Nan's Fancy! A New Pattern!! Finally! 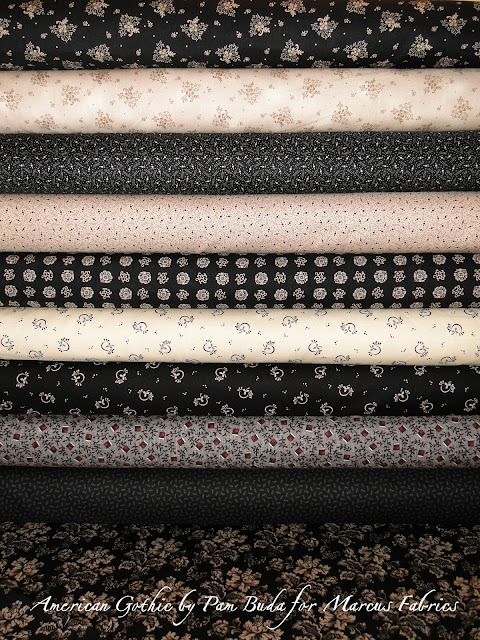 After what seems like forever....my new pattern featuring my American Gothic fabric collection is here!! 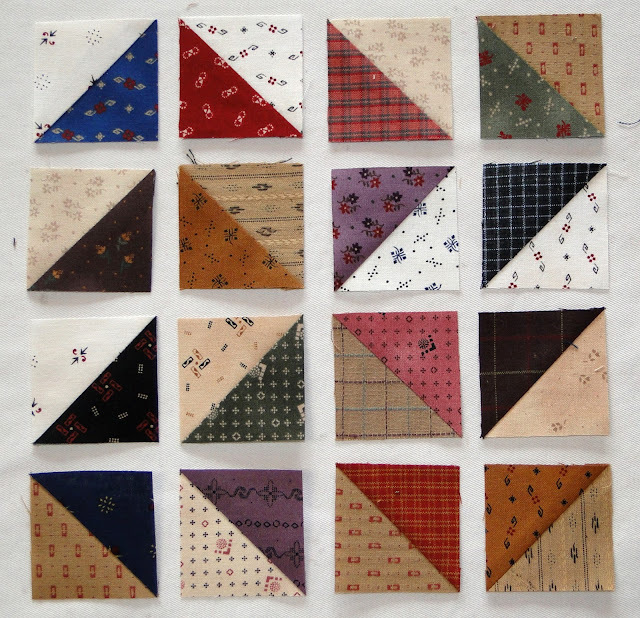 The blocks are a variety of American Gothic fabrics so they're scrappy, and there's only two fabrics used in the setting of the quilt to give your eye a place to rest. 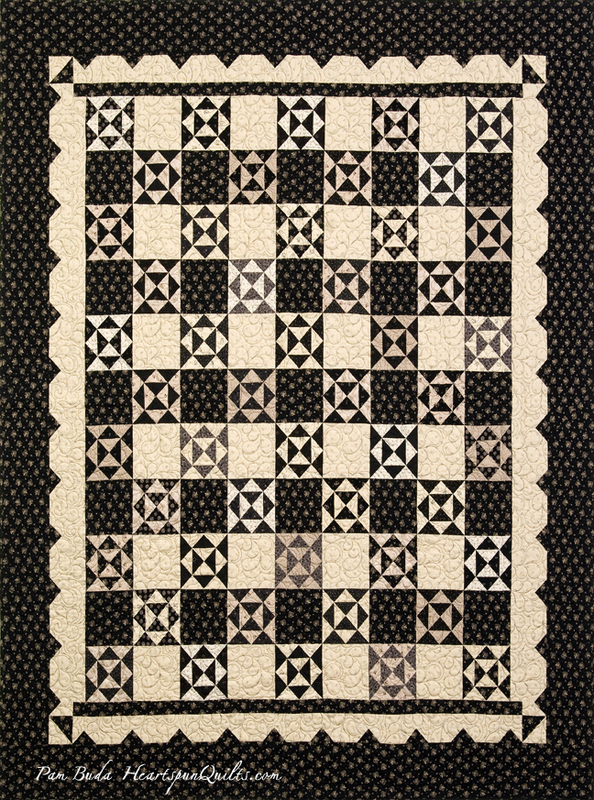 I love how these simple blocks create quite the stunning contrast on the inside of the quilt, and the pieced border gives the illusion of a scallop border facing inward! 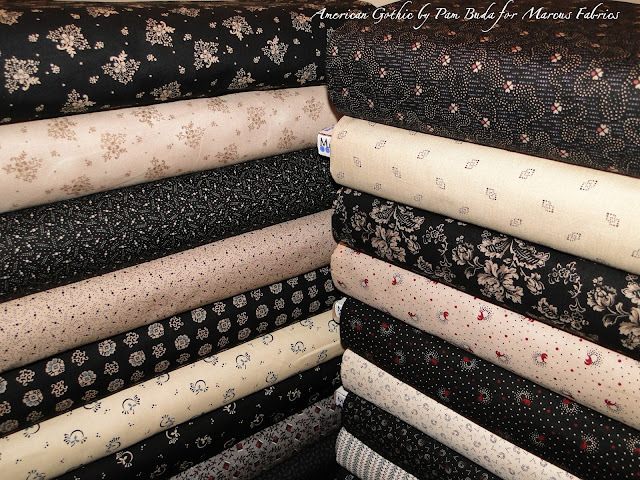 You may know that my fabric collection was named after the famous painting named American Gothic. In my research, I read that the painter, Grant Wood, used his dentist as the man in the painting, and his sister, Nan as the woman. Interestingly, they actually never stood together to pose for Grant. 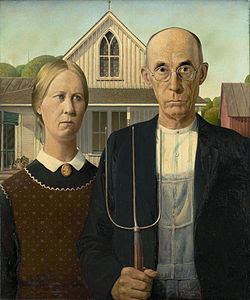 He thought they looked like a simple couple that would have lived in the 1800's, and dressed them as they would have dressed then, and purposefully added the pitch fork, pot of flowers, and barn, to signify domesticity of the era as well. So...I decided to name the pattern after Grant's sister, Nan....and, tongue in cheek, added the word "fancy" because she is so NOT fancy! 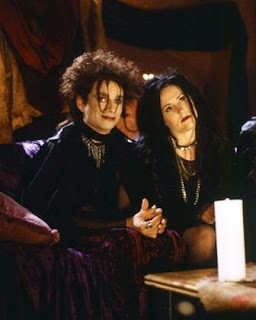 They're just plain folk...and I think they're just fine the way they are! That's my story. The black in their clothes really sets off the other muted colors in the painting, I think, as it so often does in our quilts! Here's a few more photos of my Nan's Fancy quilt. Remember...I'm sooo not a good photographer, so please excuse the photo quality. Guess What? You can order a kit! Nan's Fancy and ship in October!! I'll include the pattern for FREE!!! Click here to pre-order your Nan's Fancy kit. Click here to pre-order the Nan's Fancy pattern. Remember...orders will be processed in early October! Arrange (8) light squares and (8) HST as shown. Sew together as you have all of the other blocks. This time, though, MAKE (4) blocks! Yup....you need four of these babies! They should all measure 6 1/2" unfinished. 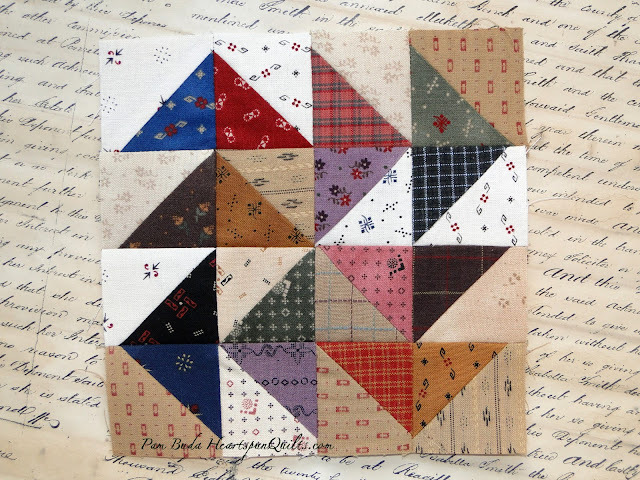 I'm so jazzed for next Friday's post when I can reveal what the quilt looks like!!! I've been planning this quilt and sew-along for many months. We're almost there!! So...next Friday, we'll meet again.....same place, same time!! Mistakes Can Be A Good Thing! Today, I had originally planned on introducing Nan's Fancy, my quilt designed for my new American Gothic fabric line, but I've decided to put that off for a few more days. The quilt is being bound right now and headed to my photographer on Friday. I thought it would be much better for you to see Dan's photo (my photographer) than mine, so please bear with me until next week. In the meantime, I thought I'd share a mistake that ended up to be a good thing! Buy the pattern for $5!!! 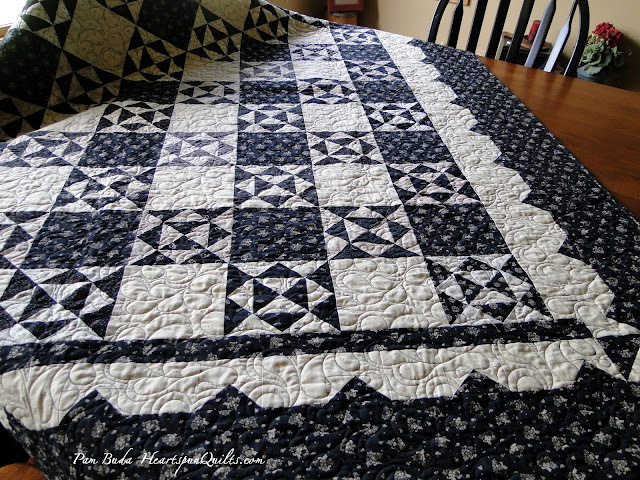 This quilt is easy breezy to put together! The size of the quilt is 65 x 77. Oh, and I've seen it made as a wall hanging, too! Hopefully, I'll be seeing you here on Friday for another part in my Nabby's Dowry Sew~Along! We're getting close to the big reveal!! So exciting!! American Gothic Arrives In Shops! It's always an exciting day when a new line of fabric arrives on the doorstep of your favorite quilt shop. Guess what is being delivered right now??? American Gothic has been delivered to a shop near you!! These prints turned out soooo great!! 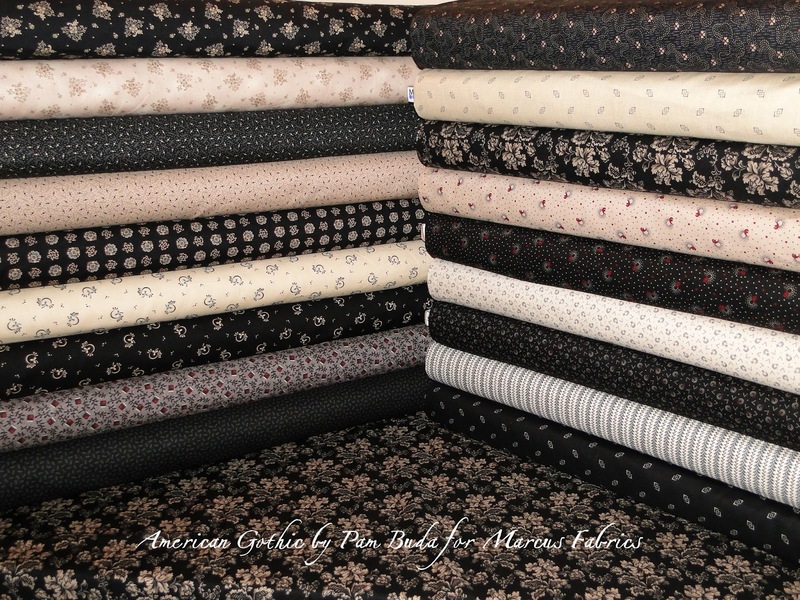 Marcus Fabrics just does a wonderful job of creating the best quality goods in the industry! ....and while I was at it, how about a little dusty soldier blue here and there, too! this is the image you should have in your mind! 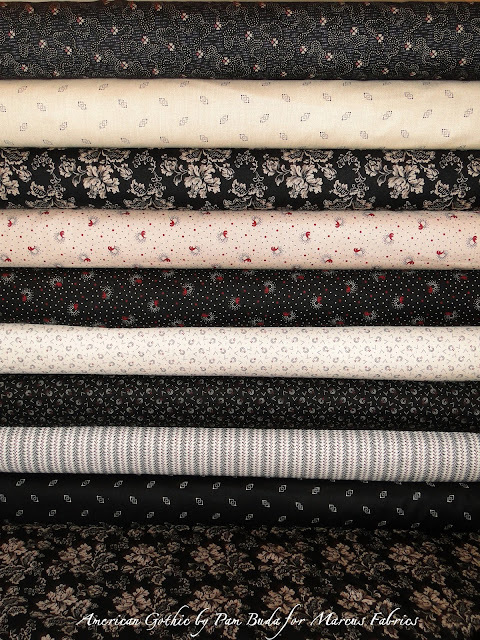 Please visit your local quilt shop to pick up a bunch of American Gothic fabric for your stash. If your local shop doesn't have it, you can click here to purchase a Fat Quarter or Fat Eighth bundle of American Gothic right from my website. 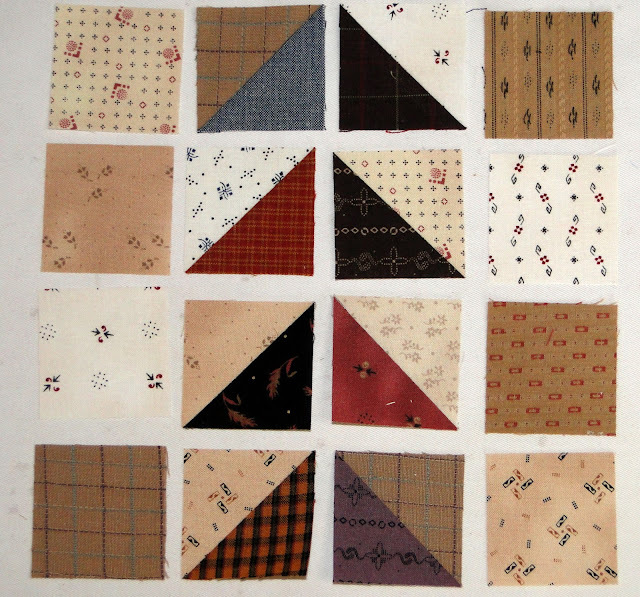 I created a quilt using the American Gothic collection, and it will make its debut in my next post! Thanks for stopping by to visit and allowing me to share my excitement with you! All together now.....sew units into rows; press for opposing seams. Sew rows together. Block should measure 6 1/2" unfinished.